NEW YORK (Reuters) - The steepest decline in U.S. retail sales since 2009 in December halted a broad rally in world stock markets on Thursday and pushed investors into the safety of government bonds. 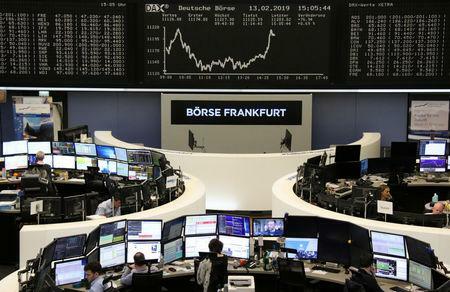 European shares fell 0.3 percent after earlier touching three-month highs. 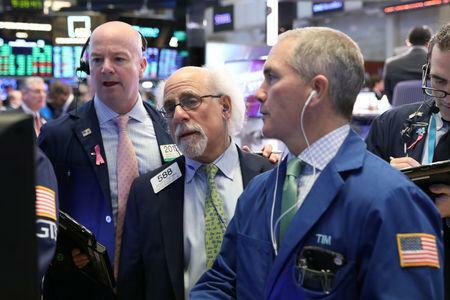 On Wall Street, the Dow Jones Industrial Average fell 103.88 points, or 0.41 percent, to 25,439.39, the S&P 500 lost 7.3 points, or 0.27 percent, to 2,745.73 and the Nasdaq Composite added 6.58 points, or 0.09 percent, to 7,426.96. 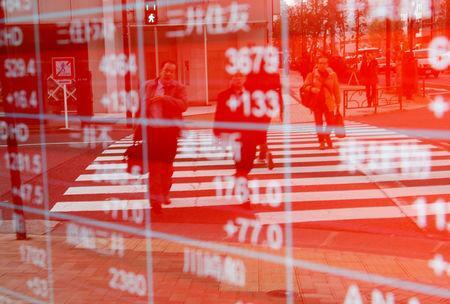 MSCI's gauge of stocks across the globe shed 0.19 percent. The drop in retail spending in the world's largest economy heightened investor fears of a global slowdown. Any optimism was further dimmed by data released on Thursday showing an unexpected increase in the number of Americans filing claims for unemployment benefits last week. That pushed the four-week moving average of claims to a one-year high, an indication that job growth was flattening. "The numbers were a bit of a surprise on the downside and that is critical because this is for December and it suggests that people weren't spending enough on holiday sales shopping," said Randy Frederick, vice president of trading and derivatives for Charles Schwab in Austin, Texas. The sharp fall in spending overshadowed optimism about U.S.-China trade talks and strong earnings from Nestle, drugmaker AstraZeneca and plane giant Airbus. The euro fell near a three-month low as data showed Germany's economy stalled in the fourth quarter, with fallout from global trade disputes and Brexit threatening to derail a decade-long expansion in Europe's economic powerhouse.. That left the dollar near its highest since mid-December against a basket of currencies at 97.059. Benchmark 10-year U.S. Treasury notes last rose 15/32 in price to yield 2.6518 percent, from 2.706 percent late on Wednesday. Russian stocks and bonds were also dumped as a rare bipartisan move from U.S. lawmakers proposed stiff new sanctions on Russian government debt, as well as some banks and oil and gas firms. On China, U.S. President Donald Trump said on Wednesday that trade talks were "going along very well". Bloomberg said Trump was considering pushing back the March 1 deadline for higher tariffs on Chinese goods by 60 days. U.S. crude gained 1.1 percent to $54.50 per barrel and Brent rose 1.6 percent, to $64.63 per barrel. "Thanks to healthy oil demand growth and lower OPEC+ production ... we see the market tightening further over the coming months," UBS analyst Giovanni Staunovo said. "As such, we continue to expect Brent oil prices will move up to $70–80 a barrel over three to six months."